I want to tell a story set in New York City. The city is changing to become something else, making Progress, the Way Things Are Going, going from a city of poverty to a city of tremendous wealth. My MC is a character from another place who is new and uninformed and wants to Understand what is happening in the world at large before an important milestone in the life of the nation. But I can't write that because Dramatica won't let me do that. The closest I can get is making the OS concern The Past -- the characters all are concerned with distancing themselves from the Past. Once I select Understanding for the MC, the gate slam down and I get to pick any color as long as its Memory or the Past. But that's a compromise. It' not what I want to do. I repeat: it's not what I want to do. I'm having to twist what I want to do, to fit it into Dramatica. 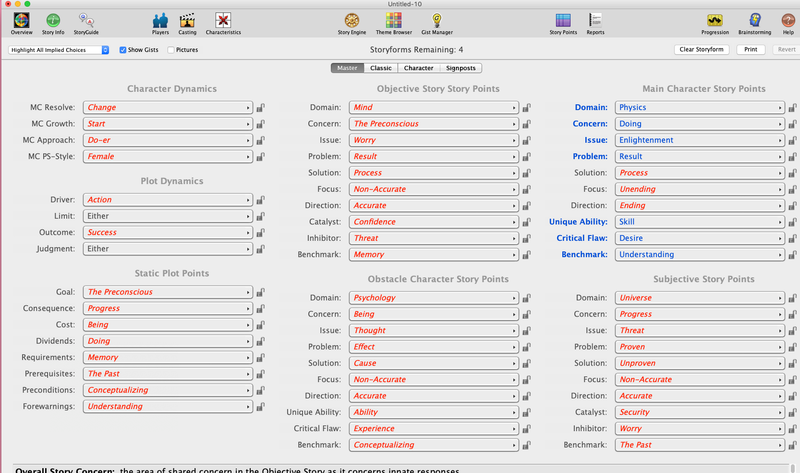 I am negotiating with Dramatica to pick a story it finds acceptable. We are staring eyeball to eyeball, waiting for the other guy to blink. Is this the way it's supposed to work? Why should I accept this? Hmm. Maybe the answer is multiple story forms. I just made three that seem to me to fit together in the telling of a more complicated novel. The city is changing to become something else, making Progress, the Way Things Are Going, going from a city of poverty to a city of tremendous wealth. What is the overall group, and what conflict and turmoil and issues are they facing? What is the actual source of this conflict and turmoil? Answer these questions as if you were speaking to someone unaware of Dramatica. What are this character's own personal troubles, separate from everyone else? What is the source of these personal issues and troubles and conflict and turmoil? 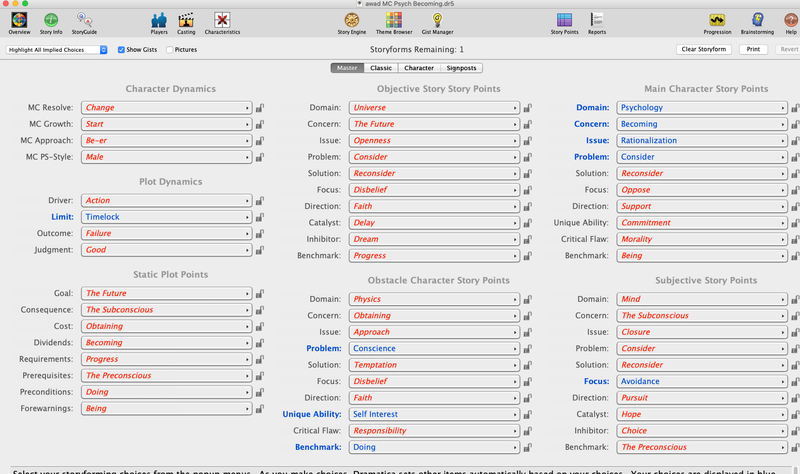 Of course, it is possible that you have multiple storyforms, but my initial impression here is that you've got storytelling ideas and storyform ideas mixed into one bag here. The problem is inequity, in the storyform where the MC concern is Understanding. Let me try the MC Universe idea. I could see something like this. In addition to what @Hunter said, have you considered the possibility that what you're seeing in you OS as Progress or your MC as Understanding is not a Concern, but is either a Signpost and/or a Benchmark? they were concerned with baseball. the issue was, would the yankees win the pennant? the problem was they'd hired too many old players and paid too much money. the focus was on Miramex, their star pitcher, who had thrown out his arm, and getting him healed for the game. Jim's concern is understanding yankees baseball, well enough to write about it professionally. Jim's issue is knowledge. He's been in England since he was ten, his father was an ambassador. His direction is to learn fast and immerse himself. Jim's problem is he's probably not suited to be a baseball writer. His solution is to be a great cricket writer. This is the story form I've been working with for about a week and suddenly went into a panic about today. Not really. He is driven to understand the whole clockwork of New York, as a puzzle to be solved. It's the reason he came to New York in the first place, to crack the world of power open and look at, and see what it really is. As far as he's concerned everything he does is in service of that. If he forgets his self-described mission, he's failing. It's an obsessive drive, interfering with his friendships, relationships, jobs etc. If I did something like this, understanding is the benchmark. I can sort of see that. But other throughlines are incomprehensible to me in terms of my story. At this point, the little voice in my head is just screaming "PICK ONE. IT DOESN'T MATTER WHICH ONE. JUST PICK ONE." Because how can you choose, without already knowing your story? Please note carefully that in the following, capitalized terms, such as "Concern" and "Issue" are Dramatica terms, while non-capitalized terms, such as "concern" and "issue" are everyday terms like you might use with a non-Dramatica friend. This all looks way too much like Storytelling. 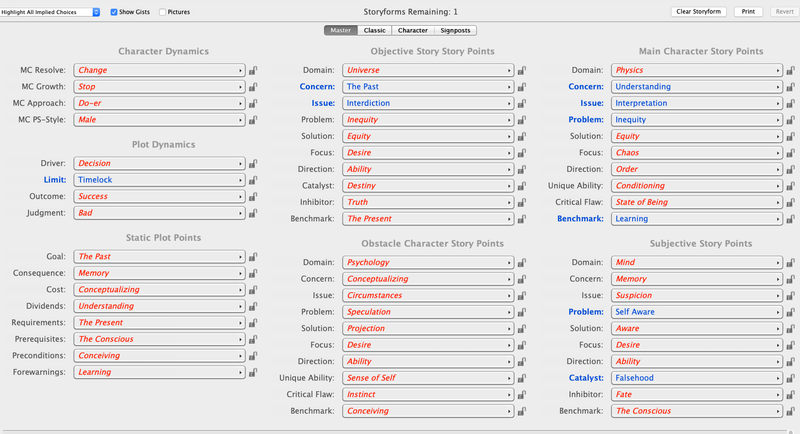 I don't think there's much in here that can actually be used to find a Storyform. A concern for baseball isn't enough to choose a Concern. Whether or not the Yankees will win isn't enough to choose an Issue. And, I could and should present a similar sentence for most points that you've labelled with a Dramatica term.The thing is, none of the sentences in this list are really a proper encoding. Some come close, but there's not really any Dramatica-oriented information here. Every facet of Dramatica should be used as a source of conflict, and should be encoded as such. What you've presented is a list of facts, but I don't see how any of them are a problem. There's no sense of how they lead to conflict or turmoil. All that said, what you wrote for Focus and Direction for Jim actually look pretty good, especially since these are two of the most character-oriented items in Dramatica. Per those lines, it looks like you want Jim to believe the source of his own personal problems is his ignorance. Thus, to Jim, the correct solution would be to dig in and learn what he doesn't already know. Well, this is mostly true, actually. Though, if you know enough of your story, that's where Dramatica can shine. Speaking to that, I'd really like to help you find a story form for what you want to write, if you'd allow me. Based on your replies thus far, I'm guessing that your overall group is the baseball ecosystem: players, managers, fans, etc. It also seems that any conflict this group will experience, such as fights on the field, or maybe deliberations in a mangers office, or other possible conflict is a result of trying to win the pennant. Is this your intent? He is driven to understand the whole clockwork of New York, as a puzzle to be solved. It's the reason he came to New York in the first place, to crack the world of power open and look at, and see what it really is. As far as he's concerned everything he does is in service of that. If he forgets his self-described mission, he's failing. It's an obsessive drive, interfering with his friendships, relationships, jobs etc. Now we have some information about the turmoil that Jim is experiencing. By this, it seems that Jim's problems are the effects on his friendships, his relationships, his job, and similar things. It also looks like the source of this is his attempts to "crack open the world of power" and "reveal what this world really looks like". 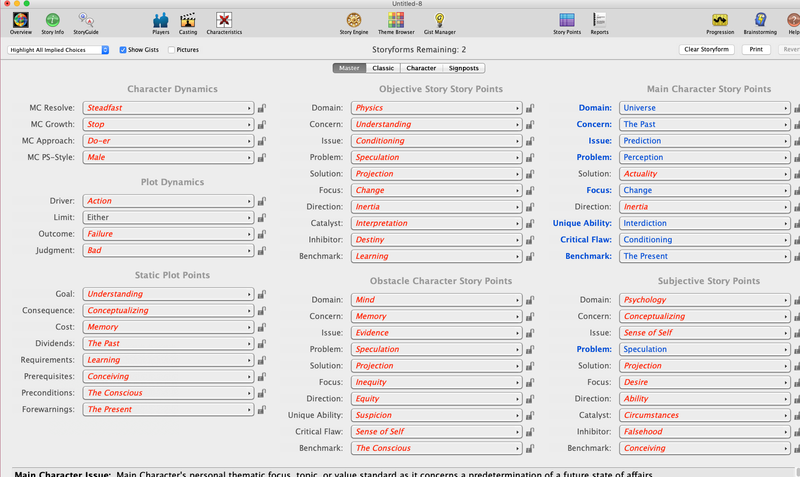 This is an excellent source of information to start building a Storyform. Everyone in the baseball world is acting toward the goal of winning of the pennant. Jim's personal issues are loss: loss of relationships, of jobs, and possibly other things. Jim's personal issues are a result of his attempts to crack open and reveal the truth about power. Jim believes that these personal issues are due to his ignorance about baseball and NYC. Jim tries to solve his problems by digging in and speed-learning this unknown grit and detail. Wow, first, THANK YOU for digging into this. Your willingness to do that is great, and appreciated. But I'm not writing about baseball. That was a 'for example' thing I threw out there. I am sorry to have misdirected you so that you wasted your time on it. I will be more careful about what I put up here. The one thing you liked is the one part that's the real part of the story. Let me come back to this. And thanks to everyone for putting up with my anxiety about this. I'd really like to help you find a story form for what you want to write, if you'd allow me. I completely accept your help, but want to take it to DM. I am sorry to have misdirected you so that you wasted your time on it. No time wasted. I'm sure what I posted will be helpful for others in the future.